Drinks are always on the house when you serve homemade brews and sodas from this double-tapped drink dispenser with a space-saving storage secret. The lack of storage space in small kitchens constantly forces homeowners to make sacrifices. For Reddit user averagejones, the cooking and entertaining hub couldn’t accommodate her home brewing hobby. Serving fresh pours of her favorite beverages would mean trudging downstairs to get a pint from a single-tap keg stored in her basement fridge. The inconvenient trip to the basement aside, the keg swallowed a good quarter of the space in the fridge. Plus, it could only dispense either beer or soda at any given time, which was not exactly convenient when entertaining a pack of thirsty guests. Ready to re-imagine the traditional keg and reclaim lost fridge space, averagejones devised a DIY home beer tap with two taps that could serve up both beer and soda—right when and where she needed it most. To make the clever contraption, the ale aficionado enlisted 100 feet of plastic tubing and a couple of tap handles. She ran the tubing through the kitchen floor and into two slim kegs in the basement fridge, one for beer and one for soda. The separate soda and beer lines were a crowd-pleasing improvement to averagejones’ earlier single-tap keg system, since they meant more variety—now multiple users could dispense their choice of what was on tap. 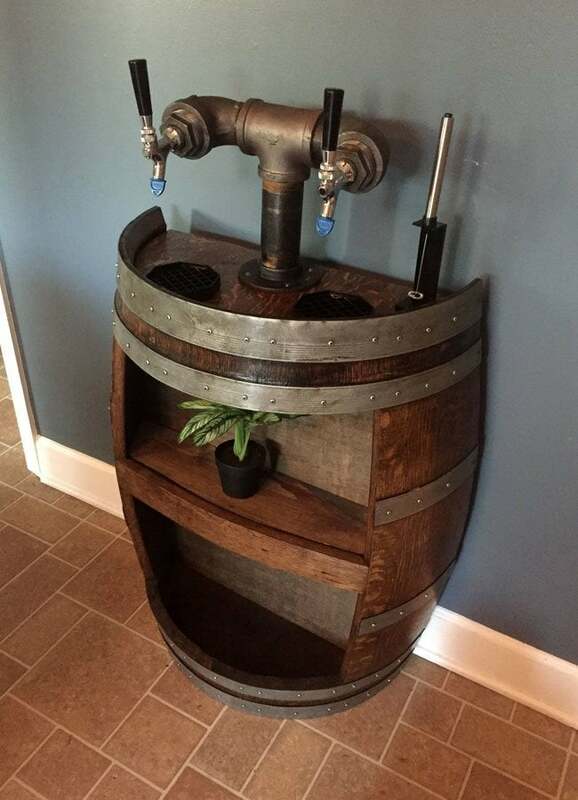 Back in the kitchen, averagejones connected the tubing to two cast iron pipes that were secured to the lid of a restored wine barrel and outfitted with tap handles. Thanks to the false back of the half-barrel, this dispenser can hide the plastic tubing behind it from view while offering shelving for glasses and other barware to boot! This DIY drink dispenser acts as a personal beverage bellhop, conveniently carrying your favorite drinks from the dusty basement to the more comfortable and social location of the kitchen. Whether you’re a self-proclaimed beer connoisseur or you simply like the idea of a personal soda fountain, follow this smart DIYer’s instructions for even easier access to your favorite beverages. You’ll gain much-needed room in the fridge and, given the space-saving silhouette of the half barrel dispenser, you’ll also reserve plenty of floor space in the kitchen for sipping and savoring good times with guests.